I bought this top on sale back in November and have worn it many times since then, however I hadn't managed to photograph it until yesterday. It's funny how that happens. Typical sweater and skinny pants = tons of time for photos. If I'm dressed in anything the slightest bit nicer it's either dark out or one of us (me, it's usually me) is running late. This simple white top has become one of my "go to" pieces for date nights / evenings. 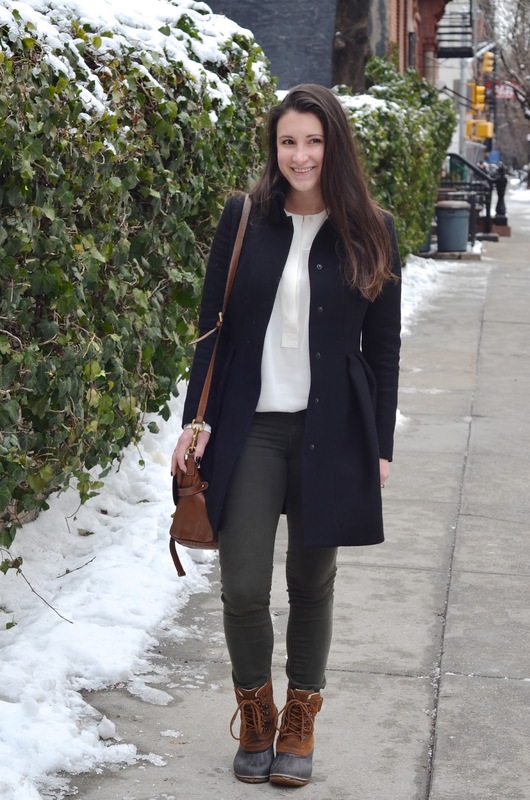 The collarless neckline and covered buttons make it a little different than your stand white shirt, while the longer length gives it a bit more versatility. You can wear it with just about anything - skirts, pants, shorts I'd imagine in warmer weather... - as well as year round. Yesterday I wore it to work with my favorite non black pants (these are seriously comfortable - nice and stretchy) and snow boots because like I said yesterday, mystery puddles. I made the mistake of wearing my regular ankle boots on Tuesday and ended up covered in little speckles of dirty slush water by the time I got to my office. It was gross. As jealous as I am of people wearing regular footwear, I think I'll be sticking with snow boots for the foreseeable future. Is anyone else having this problem? Really, it can't just be me. On a more pleasant note, don't forget to enter the giveaway here. Loving that blouse! It's so pretty!! And those dainty rings are perfect! I need them in my life! I love that little detail on your coat! The little ruffle is so ladylike! cute outfit, I need some boots like that! 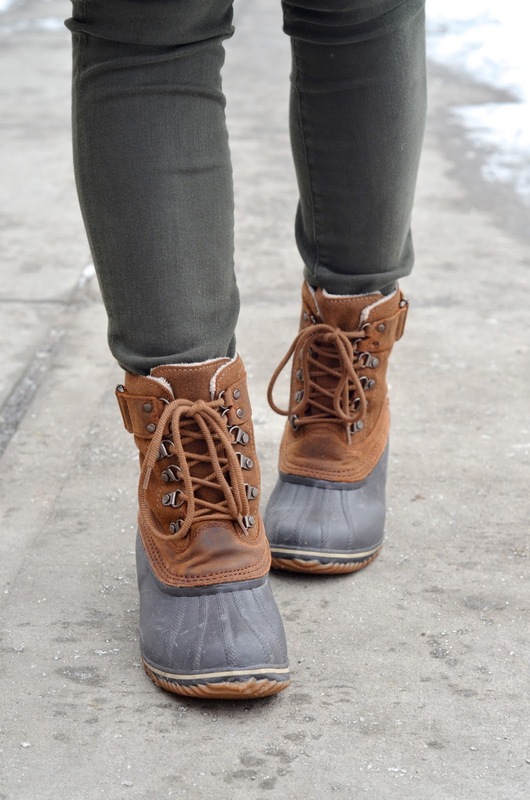 Those Sorel boots look so warm and comfy! I need them up here in Boston! 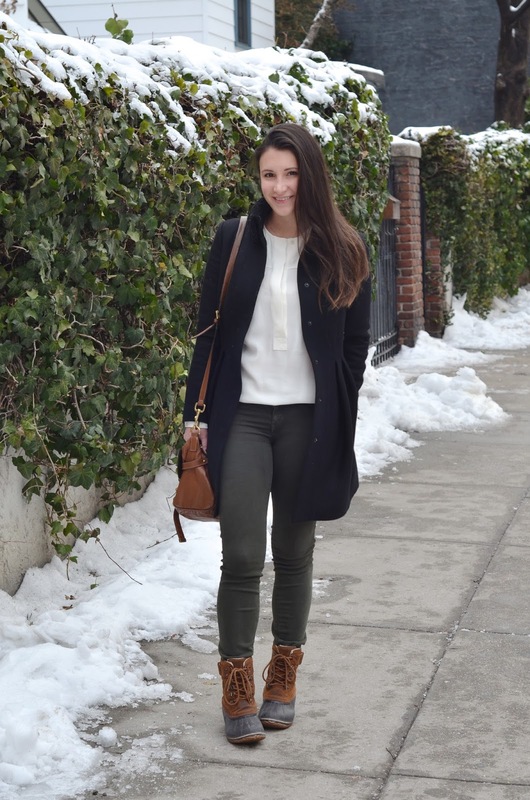 This is the perfect blouse and those boots are a winter must-have! So cute! Those boots look so comfy and perfect for snowy weather! Cute outfit, I love it!! Adorable blouse! Love it. Such a classic piece. Also, I am kind of jealous that you need the snow boots. I wish I needed some snow boots every so often! Absolutely stunning! You look amazing, as always! I am loving your coat and blouse. Very cute look!